Barricaded into a city block called The Station, two hundred souls have survived the apocalypse. So far. Was it a bomb? A biological attack? Phase one of an invasion? No one knows. The Long Silence has begun. After dark, thousands of the city's inhabitants - neither living nor dead - prowl the streets snatching survivors. The Station is under constant threat. Each day a lottery decides the seven members of The Kill Crew - a night shift of civilian soldiers. Their mission is simple: Extermination. Sheri Foley, a nobody in the days before the Long Silence, discovers she has the heart of a survivalist. She becomes one of the toughest members of The Kill Crew. But there are enemies inside the Station too. The evils of the old world persist and Sheri Foley must fight them all. I make no secret that the debut novel of Joseph D’Lacey, “Meat”, didn’t sit well with me and failed to meet any of my expectations. Therefore I was rather reluctant to read his novella, “The Kill Crew”, but as anybody deserves a second chance I picked it up eventually for a reading. 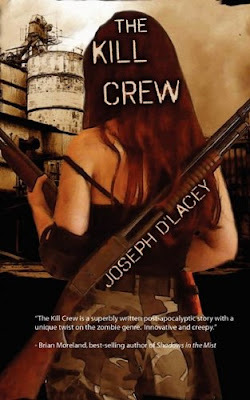 Joseph D’Lacey’s “The Kill Crew” is a post-apocalyptic story and after turning the pages of the novella it is obvious that the author doesn’t do anything groundbreaking for this particular type of genre. His story isn’t new, an unknown event puts an end to the world as we know it and divides the survivors into two groups, the Stoppers and the Commuters. The Commuters, in a zombie-like state, try to turn the other survivors in a similar existence while the Stoppers try to fight and survive them. The story felt for me at this level very much like “I Am Legend” or “28 Days Later” with the exception that the Commuters don’t attack the other survivors with the specific goal to eat or kill them. Joseph D’Lacey’s story offers moments of tension and action, but it has its gaps. However, since the story is the background for the deeper levels of the novella and the gaps within the story are minor they didn’t represent a major obstacle for me. “The Kill Crew” doesn’t excel when it comes to the story, but when it comes to the psychological and emotional aspects than the novella turns into something very different. Joseph D’Lacey focuses on three characters, with preponderance on Sheri Foley, following the trials they pass through on the psychological and emotional level and the challenges they face because of their new situation. He follows the human nature on its survival mode, the human capacity to adapt and to change, or not, to a new deadly situation. Sheri Foley, because the story is told in the first person and only rarely shifts from the main character perspective, struggles with emotions and none of them seem to be artificial, because they are present with reason and logic. The only thing that Joseph D’Lacey’s novella left me wondering is how such an event will affect me (not that I would like to find out). “The Kill Crew” works on the affection level and this is what makes it stand out from the usual apocalyptic or zombie-like fiction. With it Joseph D’Lacey convinced me not to look with reluctance on his next work I’ll find. i'm oddly in love with that cover. I loved this novella and it made it on to my Top 5 Reads of 2009!